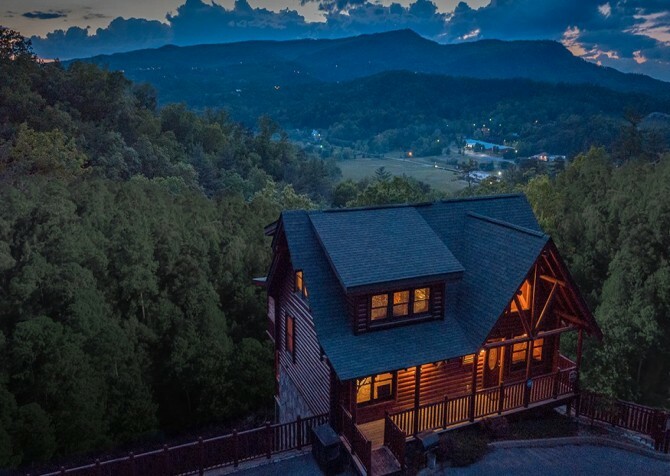 From exquisite mountain views and evening soaks in the outdoor hot tub to film nights in the home theater and spa baths in the jetted tub, a stay at this Pigeon Forge cabin will feel like Knockin’ on Heaven’s Door! Located in the Covered Bridge Resort, this 5-bedroom, 4-bathroom home boasts community pool access, a fully loaded arcade unit, a 67-inch flatscreen TV, and a fully equipped kitchen. Splash with the little ones on summer days, invite your friends to an arcade battle, catch up on your favorite TV drama, and whip up family meals for all to enjoy — the options are endless. Get your vacation started in the living room with a romantic cuddle with your spouse on the love seat, or a magical story with your little one in the arm chair. Let the toddlers pal around on the large area rug to get out their travel wiggles while you keep a casual eye on them from the couch. When evening comes, get a fire going in the fireplace, pop a romantic comedy in the DVD player, and enjoy movie night on the 52-inch flatscreen TV! With an open concept throughout the home, you won’t have to miss your favorite part of the film when you go to the kitchen for a popcorn or drink refill. Featuring sleek, black appliances, this fully equipped kitchen is ready for morning meals, fresh lunches, delicious dinners, and snacks all day! Brew a Starbucks blend in the coffeemaker or an herbal tea on the stove, grab veggies from the fridge for a BLT, bake lasagna with a twist in the oven, and delve into the chocolate ice cream at midnight — it’s your vacation, after all! Enjoy freshly cooked meals in the spacious dining area, boasting a large wooden dining table with 8 cushioned seats. Keep rolls, biscuits, butter, jam, and any other featured side or condiment on the table to keep seconds within arm’s reach. During the day, take advantage of the natural light streaming in from the many windows to catch up on a book or write one of your own. In the evenings, clear the table for board and card games — bring your favorites! Head to the lower level for movie night and more games in the theater room, harboring a 67-inch flatscreen TV, DVD player, surround sound, and an arcade unit with more than 60 games — bring it on, Pac-Man! Light a toasty fire in the fireplace to set the mood, chill with a glass of wine from the wet bar, and recline in the theater seats with built-in drink holders — what a life! With a mounted flatscreen TV in all 5 bedrooms, the entertainment won’t stop even when you sleep! Featuring 3 queen-size beds (with memory foam mattresses) and a log bunk bed dispersed between the 2 lower-level bedrooms and 2 entry-level bedrooms (plus 2 queen sleeper sofas), everyone will have a lovely place to rest their head. However, if you’re in need of extra amenities and a touch more comfort, claim the master suite for yourself! Taking up the entire third floor, the master bedroom of this home is a true escape, boasting a king-size bed with a memory foam mattress, private en-suite bathroom with a double vanity, indoor jetted tub, 52-inch flatscreen TV, DVD player, queen sleeper sofa, and best of all — heavenly mountain views! When you arrive at this cabin, you’ll be greeted by only 1 step, meaning easy access to and from the cars. In other words, loading and unloading the kids won’t be a hassle. As life in the Smokies is always better outdoors, head to the decks for a meal on the dining table for 4, a rest in the porch swing, a chat in the rocking chairs, or a soak in the hot tub — all while admiring incredible mountain views! As a bonus, a charcoal grill is provided for cooking adventures and barbecue parties. Grill burgers for the whole group and pile on veggies for a healthy choice. Better yet, go for juicy steaks paired with a few local bottles of red — what could be better? Located in the Covered Bridge Resort, this home features community pool access, so your summer can be filled with cool splashes, hold-your-breath contests, and casual sunbathing. Even better, complimentary Wi-Fi is provided to make checking emails and catching up on Netflix dramas super easy. There is also a PlayStation 2 in one of the bedrooms with gaming classics for friendly competitions. Don’t forget the provided washer and dryer, ready to clean your clothes and towels so you don’t have to bring extras! While it may be a struggle to leave the comforts at Knockin’ on Heaven’s Door, be sure to schedule at least a bit of time to venture into downtown Pigeon Forge for fun games, fantastical quests, and epic rides. Challenge yourself and your buddies to save the world in only 60 minutes at The Escape Game! Grab your wizarding wands and solve the mysteries within MagiQuest — only the brave and pure of heart will succeed. View adorable goats on the mountainside as you glide past at a speed of your choosing at The Coaster at Goats on the Roof. *Guests must be at least 25 years old to rent this property.